Painting is one way to rev your creativity, whether you're a visual artist or not. It’s a powerful feeling to have your creativity turned on and flowing freely. Likewise, it’s frustrating when your creativity hits a roadblock, and you can’t begin or complete a project. Even the most famous musicians, artists, and writers experience seasons in their life when they feel as if someone has doused their creativity. Fortunately, there are ways to unlock your inner creative power, even when you feel like it's gone for good. Sometimes, a few conversations with a trusted confidant or online psychic help you identify the source of the problem. Talk through barriers that stand in the way of your creativity. Are they physical barriers such as not having a quiet space to work? Are they mental barriers that prevent you from engaging your imagination? By verbalizing your challenges, you can begin to develop specific strategies to overcome them. Initially, it seems counterintuitive, but placing limitations on yourself forces you to get more creative. For example, have a friend make two to three random marks on a sheet of paper. Then, use those lines to draw an animal. The lines serve as the limits, forcing you to make sense of their randomness. As you exercise and stretch your creativity, it becomes stronger. Your creativity gets stymied when you have unrealistic expectations. Because the creative process is messy, you have to allow room for failure. Those wrong turns are a part of the journey to get you to the final product, whatever it may be. Instead of criticizing yourself or getting frustrated when you decide to start over, relax and appreciate the false starts. They help you hone in on the idea that you’ll shape into something you’re proud to share with the world. Quieting your mind and listening to your inner self allows you to identify inspirations, ideas, and new ways of engaging in creativity. If meditating sounds like too big of a challenge, there are plenty of resources to help you learn to do it. Yoga practitioners, therapists, and the best phone psychics can offer suggestions for how to calm your mind and clear your head. Once you’re seated in a quiet place, spend 10 to 20 minutes meditating in silence. You may be surprised at the novel ideas that pop into your head. Give yourself a clean canvas and a new paint, regardless of whether you’re a visual artist or not. 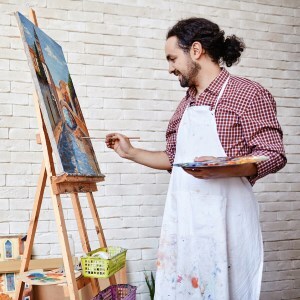 The practice of trying a new creative activity or revisiting one you’ve done in the past can unleash fresh creativity that carries over into other areas of your life. Don’t want to paint? Just grab a blank sheet of paper and colored pencils or a pen. Let go of your need to “get it right.” Instead, let your hands and mind flow as you create on the white surface. With practice and a bit of work, you can reignite your creativity, even if it’s in a slump.